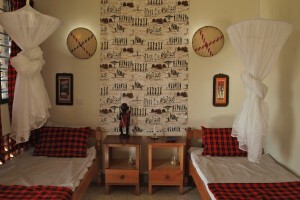 The ground floor includes 8 double rooms with private shower and toilet. Upstairs, there are two double rooms and four family rooms without toilets. The family rooms consist of bunk beds with 4-6 beds total. All of the rooms on the ground floor have private sponsors who have named the rooms and assisted with the design and decoration. The showers and toilets are completely tiled. Hot water is generated by solar panels on the roof.